I have spent the last week doing some real thinking about the current WIP (working title -Gilded Scarab) and particularly around why I’ve found it so hard to gain any traction with it, something like 40,000 words in. I had it as a fairly deep PoV with my main hero, Rafe Lancaster, front and centre. But it still felt drab and lifeless and really rather boring. It needed some spice, and one particular problem was that Rafe didn’t meet his love interest, Ned Winter, until far too far into the book. I mean, I had written that 40,000 words and Ned still hadn’t walked through the coffee shop door! So, I did two things this week to try and remedy it. First, I engineered their first meeting to take place much, much earlier. Ned might not have been using his full name at the time, so that Rafe knows of him by a slightly different alias but they meet in a club for very special gentlemen, both of them looking for a casual hookup. They get it. I can then send Ned off to Aegypt for a winter’s digging and have Rafe buy the coffee house and settle into his role there, and when Ned walks through that door in March 1900, it won’t be his first appearance. He and Rafe will have *history*, and history that will need to be sorted out and will spice up the friendship that will grow all that summer and adds an extra twist to their relationships with a third man who is somewhat problematic. It gives the book a much needed boost. Second, I carried out another little bit of retrofitting. I converted the story to First Person. if the story is more immediate if it’s completely in Rafe’s voice, with no narrator present, then the emotion should be more powerful, more immediate too. There’s no filter, other than the ones Rafe himself puts in place. Yes, that’ll be a onesided story, but it pretty much was going to be that anyway, using deep third person. I’ve just removed ‘me as narrator’ as an extra filter. think about the potential for reliable/unreliable narration. Everything will be filtered through Rafe. That’ll be a real test of how convincing his character is, how honest and truthful he will appear. That’s a challenge! But of course I have worries. will Ned and the other characters blossom as personalities of their own if they’re always filtered through Rafe? He sees them in particular ways, of course, and I’ll have to work extra hard to let their characterisation show through despite Rafe’s own prejudices and the baggage he brings to bear. For example, his first encounter with Sam Hawkins, Ned’s bodyguard, came from having a harquebus pointed at him as Sam got Ned into an autophaeton. It’s going to be some time before Rafe will warm to Sam and that will colour how Rafe presents him to us. But the characters have to have mannerisms, dialogue, and action that makes them more than cardboard cutouts and hopefully the reader will see why Sam did what he did, even if Rafe is still resenting it, because Sam himself is alive enough and individual enough to show the reader. It’s a challenge, though. this is where we get into the risk of too much exposition. I already have a tendency to be a touch (cough) long-winded (cough). With only Rafe to explain everything, I shall really have to work hard to stop him talking constantly to camera, off on some windy exposition. 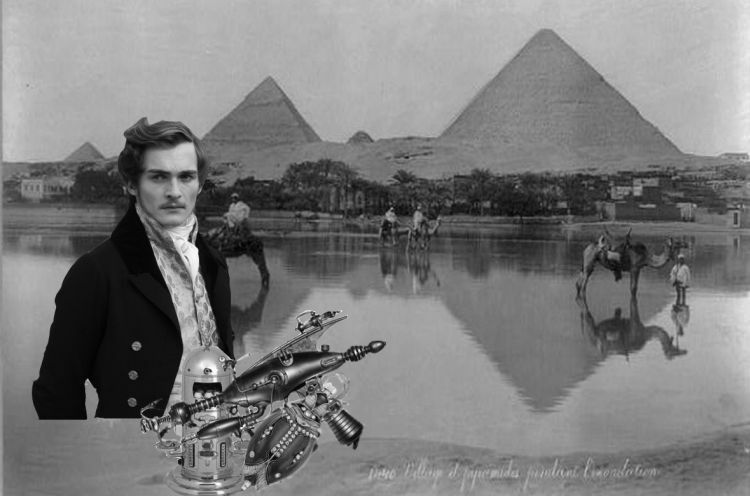 If he’s explaining it to us, describing stuff – Cairo in the winter of 1900, for example, when he arrives there with Ned – then the picture Rafe presents has to be compelling and vivid, to overcome the sense of a disembodied voice giving us a sort of narrative travelogue. Show, don’t tell to the max, I think – dialogue in real time, action in real time, character interaction with their settings and each other in real time. and while I’m avoiding too much exposition, I have to avoid summarising scenes too much. Oi vey. Finding the balance… well, actually, I think that will come from Rafe’s personality. He’s an gregarious soul: fun and entertaining. At least, he thinks he is and so do I! Hopefully that very character trait will prevent him from either being too boring or too brief. He likes to play to his audience and I have to hope that he’s skilled enough to do that well. Basically, I need him to be so engaged himself, that he entices the reader in with him. Rafe has to have a good reason for telling his story. As first person narrator he’s chosen to explain his life to us, from some point in his future. He’s looking back and sharing with us how he got to where he is. Why? What’s the ‘frame’ for the story? That’s something I’m still thinking about How far in the future Rafe is, looking back. So, basically, wish me luck. Rafe’s already a lot happier, I can tell you, being allowed to tell his own story in his own voice. Let’s hope it works. Have you ever written in First Person? How did it work for you? And as a reader, is it a big turn off or don’t you care if the character is compelling enough? As a reader, I find first person can actually be more distancing than third if I don’t click with the character for some reason. But when it works, it *really* works. And having read Rafe’s voice here, I can see why first person is absolutely perfect for him. I’m still laughing about the shaving soap even as I’m typing this. Yes, I’m still not ultra convinced, if you see what I mean. Only mostly convinced, but there’s no denying that Rafe sprang into life when I gave him free rein. 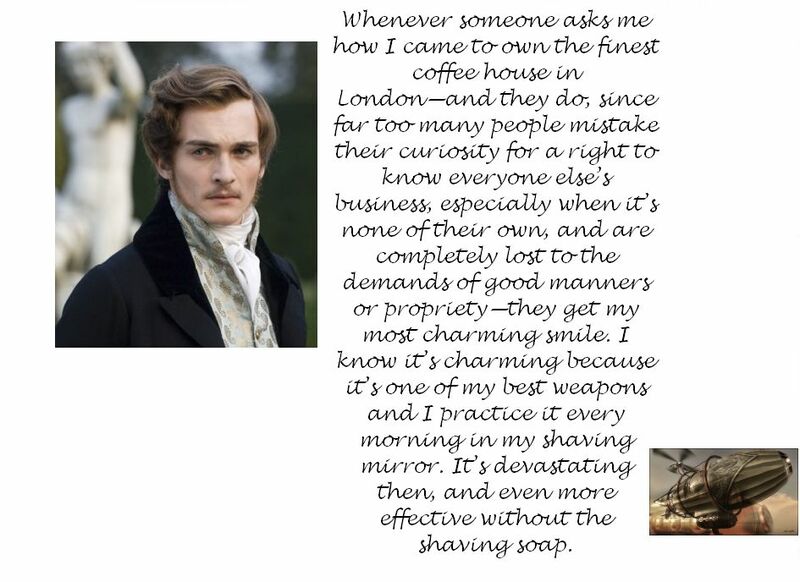 That sardonic little voice that you get in with the shaving soap is very him!